At Frieze Masters 2015 in London, gallerist Helly Nahmad presented paintings by French painter and sculptor Jean Dubuffet (1901-1985). 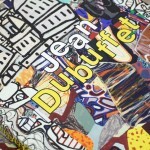 Jean Dubuffet is known for his interest in ‘low’ or ‘outsider’ art, and for founding the art movement ‘Art Brut’. Dubuffet was inspired by the works of patients in the asylums of Switzerland and France. Helly Nahmad wanted the visitors to be able to experience this connection. Hence Nahmad commissioned installation designer Robin Brown to create a stand that reconnects Dubuffet’s works with the art that originally inspired them. Brown conceived a suite of rooms that invoke the sanatoria that had caused Dubuffet’s interest in Art Brut. The rooms are covered with images derived from the Art Brut, but it’s not a recreation, it’s a reimagining. In this video, Robin Brown talks about the concept of the stand, its components and creators, and his personal background and projects. 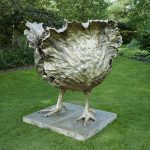 Robin Brown is a multi-award-winning Art installation and Production designer working in the British Design and Film Industry now for 25 years. Jean Dubuffet The Asylum. Helly Nahmad London at Frieze Masters 2015. 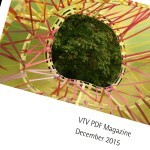 Interview with installation designer Robin Brown. Regent’s Park, London (UK), October 14, 2015. 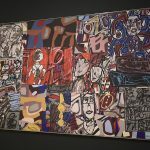 “In ‘The Asylum’ works by Jean Dubuffet are reconnected with the art that originally inspired them. Dubuffet was the great advocate of Art Brut, coining the phrase and celebrating the artistic output of the marginalized. Art Brut embraced the outsider, including the ‘primitive’, the eccentric, and the untrained. Its beginnings were in the asylums of Switzerland and France where, in 1945, Dubuffet discovered works of art by the patients. These were the product of compulsion rather than aesthetics, and were filled with a refreshing directness. The visceral jolt they caused would alter the course of Dubuffet’s life. ‘The Asylum’ is inspired by that crucial moment of direct contact with Art Brut and its creators. 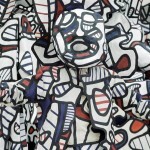 We are placed within a suite of rooms that invoke the clinics and sanatoria that had prompted Dubuffet’s epiphany. This is not a recreation: it is a reimagining. The rooms explode with images derived from the Art Brut that so fascinated Dubuffet. The scrawls, scratches and scribbles covering so many of the surfaces conjure the mania and frenetic energy that had originally struck him. As well as becoming a prominent artist, Dubuffet founded the Compagnie de l’Art Brut in 1948, bringing wider recognition to this area. Its ever-expanding collection was shown first in the basement of the Galerie René Drouin, and subsequently was shown first in the house of Alfonso Ossorio near New York. There, works by various outsiders hung alongside Ossorio’s collection of pictures by Willem de Kooning, Jackson Pollock and Clyfford Still. The Art Brut collection later returned to France and was exhibited in Paris before Dubuffet gifted it to Lausanne in 1971, where a museum was established to house it.